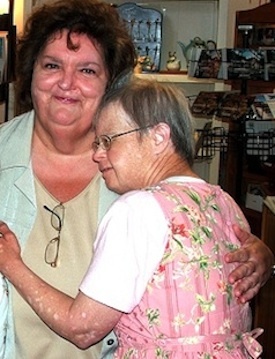 The late Janet Moore, the founder of l’Arche Cape Breton who was profiled here on her death in 2010, was a huge fan of Rita MacNeil. Janet’s friend Mary MacDougall arranged for the two to meet at Rita’s Tea Room on her 60th birthday, in 2007. Jenn Power, Atlantic Regional Co-ordinator for l’Arche (and my daughter-in-law) described the event on her blog. Those of us who love Janet were more than a little apprehensive as we prepared for the celebration. Janet is getting old, and showing her age. As with so many people with Down Syndrome, dementia is slowly creeping in and stealing Janet’s peace, her humour, her independence, her ability to enjoy life. Intense emotion can overwhelm her, and this day would surely be filled with that. Having to keep to a rigid schedule, once something she demanded and loved, can now leave her in tears. So we crossed our fingers, surrounded Janet with people she knows and who know her, and off we went. The brilliant sun over the blue waters of the Bras d’Or as we drove through Eskasoni and East Bay seemed to be a good omen. We arrived at the Tearoom in good spirits, having sung along with Rita on the CD player the whole drive down. With a friend on each arm, Janet plodded up the ramp into the Tearoom…. Before long, Janet caught sight of Rita. She squinted up her eyes, as she often does to help her focus, and tilted her head slightly to one side as she worked to connect what she must have imagined was a mirage with what evidently was becoming a reality. As everything clicked into place, she quietly, and with a sense of disbelief and wonder, exclaimed, “Rita!” In a manner fitting her age and the occasion, Janet slowly walked toward her idol, looked closely into Rita’s face to make sure she wasn’t dreaming, then gently wrapped her arms around Rita’s shoulders, placed her head on Rita’s chest, and smiled. This smile did not dim or fade once during the two hours we spent with Rita at lunch! The lunch was lovely. Rita was an absolute gem, making small talk with our strange crew of friends. She had no trouble joining in Janet’s typical teasing – “chicken legs”, “old hen”, “you’re cracking up.” Although Janet simply would not stand for anyone to call Rita an old hen! Several times during lunch, Janet would gaze at the photo of Rita on the CD she clutched in her hand (a CD, incidentally, that Rita had given her, signed, as a birthday gift) and then look up at Rita, in the flesh, sitting right next to her at the table. This seemed to be a wonder that Janet could barely comprehend. And then she would tune into the music coming over the speakers, which was (of course) Rita MacNeil. She would look up at the speakers, at her CD, then again toward her host, in absolute amazement. This woman was even more incredible that Janet had imagined! After a delicious lunch, and what seemed like endless hugs, we prepared to leave. I linked Janet over to the guest book, where her shaking hand and deteriorating vision made it virtually impossible for her to write much. But she did her best, telling me she had written her name and “I love you, Rita.” And on that note, we left to drive home. I believe that we discover what is holy, sacred, mysterious, through our relationships with others, and those few hours with Janet were filled with holiness and mystery – and not just the mystery of how Rita could be sitting at our table and singing on the PA at the same time! But that visit to the Tearoom with Janet brought me back to what is means to live a life of gratitude, to be present to each moment, to embrace my own vulnerability and allow it to bring me closer to others instead of isolate me from them. Incidentally, Rita, unbidden, picked up the tab for Janet and the 10 l’Arche friends she brought along for the birthday celebration. Quite a lady.